The events of meiosis I in a living insect spermatocyte beginning at diakinesis through telophase to the near completion of cytokinesis. 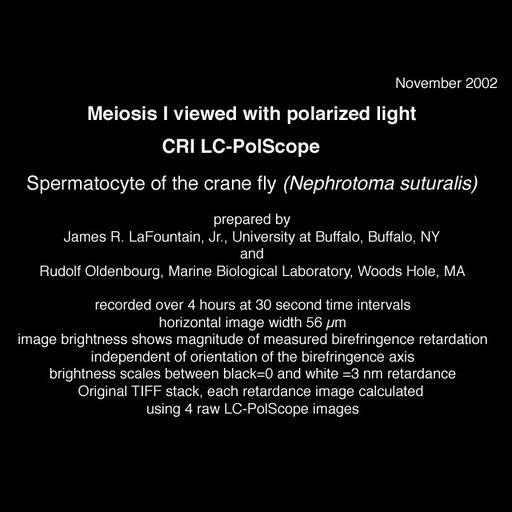 Testes from the Crane fly Nephrotoma suturalis were observed with time-lapse polarization using a Nikon Microphot SA, equipped for liquid crystal polarized light microscopy (LC-PolScope, CRi, Woburn Massachusetts) 60x/1.4 PlanApo oil immersion objective, 1.4 NA oil imm. condenser, with 1.5x zoom lens. Image acquisition and processing Camera: Images captured every 30 sec over 4 hr by a Dage-MTI C300 video camera with Scion AG-5 frame grabber. A movie prepared from this stack of images is included in this grouped set of images.